This page provides information primarily of interest to HP calculator collectors. The following guide groups calculators into broad categories based on the difficulty of obtaining. (This is mostly a matter of how hard they are to find, but more difficult models tend to cost more especially if purchased from a collector or dealer.) The difficulty ratings are for working models in extra fine to new condition. These are all relative ratings. Even an "easy" model requires some effort. By popular demand, price ranges recently observed have been added. Take these prices with a grain of salt however as some of them are based on a single sample and all of them are based on less than ten. These prices are for public sales between collectors typically advertised on the Internet. All prices are for calculators described as being in at least "very good" condition and working. Please note that if a price isn't listed here, then I don't know it. I don't try to track prices of slide rules and other brands of calculators. These price ranges do not include the bargains you can find in flea markets, government and business liquidation sales or by trolling regional for sale groups. Cheap HPs can be found if you're willing to spend the time. Generally, calculators at the high end of the price ranges were sold via "best offer" advertisements on the net or in online auctions such as eBay. 2001 Update: Prices on eBay continue to escalate while Cheap HPs can still be found (but it is getting more difficult.) Two recent debates over eBay pricing on the HP forum have involved large eBay dealers posting under aliases. The (aliased) dealers claimed that the eBay prices are the only "real" prices because that's what people will pay. The US stock crash of 1929 is attributed to people paying "the going price" for the stocks of good companies without regard to fundamental value. 1999 was similar but the US stock market has been much more resilient (at least so far.) While the most absurdly priced issues dropped in 2000, the price of the market overall as of mid 2001 is still very high based on historical fundamentals. Of course, placing a fundamental value on an old calculator is much harder. Have on-line auctions lead to a "new era" of HP calculator collecting or is this just the latest collectable to go through a speculative bubble? If the latter, will the landing be hard or soft? Only time will tell. $X : a single price is known. $X, $Y : two prices are known. $X-$Y : three or more prices are known ranging from X to Y. $X-$Y, $Z : as above but there is also one or more prices ($Z) well outside the "typical" range. (2) Some low end models like the HP-10C and HP-31E are hard to find as they tend to get thrown away. The good news that you can sometimes get them for throw-away prices. The $400 HP-10C was described by the seller as "new in the box". (4) If you really want to impress your collecting friends, collect one each of the HP-94D, HP-94E, and HP-94F. (5) HP-75C and D prices have been depressed by recent large-scale sales by several companies and government agencies. (The $3 price required the purchase of at least 25 units. Quantity 1 pricing usually starts at $20.) The high-priced samples were described as "new in the box". An eBay dealer has a large quantity of these but is auctioning them slowly to keep the prices up. Five months ago his top bids were about 3 times as high as they are now. (6) Described as Mint In Box and complete. (7) The red dot shows through a hole to the right of the power switch. The dot does not light up. (8) The $842 price (ebay) and the $25 price (offline sale) for an HP-16C were reported to the museum in the same week in 2002. Difficulty ratings are based on the experiences of the curator and a few other collectors. Your mileage may vary. The second major series (The HP-21 through HP-29). Apparently named after the small yellow character in the Peanuts cartoons. The 90 series (HP-91, HP-92, HP-95C, HP-97 and HP-97S). Definitely top of the line. The 30E/C series (HP-31E through HP-38C). Later HP-41 series models with reduced electronics. The calculators that fold. Also called the Clamshell series. The current lower end series including most models ending in B (business), S (scientific) and II. A series that never went into production. The only known model is Earthquake - a follow-on to the HP-65. A series that never went into production. No details known. Follow-on to the HP-65. Originally planned as an interim product between the HP-65 and Roadrunner (below.) The schedule on this slipped and the product became much too close to Roadrunner. Notes at an HP meeting suggest a major redefinition looking at combining the platform for Roadrunner and EarthQuake involving the use of peripherals such as a printer or plotter. Of course Roadrunner also never appeared but the concept of the HP-65 follow-on sharing a platform with a higher end model (eventually Kittyhawk) minus a printer was kept in the HP-67/97. A concern was also expressed that Roadrunner, Kittyhawk and Earthquake all had their own programming languages. This was also fixed in the 67/97. Reduced cost Woodstock member. A 6 chip N-channel and CMOS scientific meant as a sequel to the HP-55. Business desktop with printer capable of "calculating, tabulating and clock functions". A 21 sequel meant to sell for around $85. The Thunderbolt I was intended to be a rechargeable unit with an AC adaptor and the Thunderbolt II was meant to run on disposable batteries. The name HP-21B was later assigned. High performance programmable with bubble memory and an LCD display. It would have been HP's first LCD if it had gone into production. It probably would have been an HP-9x model. It would seem that the physical design was meant to be just like the Topcats because a concern was expressed about how to hide the card reader behind a clear display. Small fourth generation handheld featuring all CMOS technology. Meant as a Phoenix replacement (which also never shipped.) Disposable batteries, clock functions and "elegant packaging". Kittyhawk was eventually released as the HP-97, but at one point it was probably the code name for the HP-66. It included a tape drive, speaker and "gobs of features" according to the minutes of a 1975 product planning meeting. At the time of the meeting is was not related to or software compatible with the HP-67. From the minutes of a product planning meeting: "A suggestion was made to put all of Cricket's technology into an elegant, truly pocket size calculator selling for around $250. It would have an LED readout, 10 keys, 2 ROMS, timing functions and do about '40 things'. The appearance of the package would do justice to the selling price. This suggestion prompted an immediate lack of enthusiam [sic] and was seconded by no one thus inhibiting further serious discussion." This was a suggestion to "save" Cricket (HP-01) which was highly controversial. The meeting recap/action item related to Cricket was: "Pray for Cricket." Some HP calculators had manufacturing variations. This page lists relatively obvious changes. Some details like the exact plastic and trim colors, and minor ROM revisions are not listed. This page also doesn't list the many singular oddities that collectors have found such as HP-25s that have continuous memory etc. Most of these are probably the result of swaps during repairs. Serial numbers on classic models were printed on stickers applied between the feet or in the battery compartment. 20 series (and HP-10 and 19C) serial numbers were molded/heat stamped into the plastic on the bottom or printed on stickers in the battery compartment. 10C series serial numbers were placed in the same general area but their exact position varies noticeably. There have been a number of calculators made to celebrate certain anniversaries. The HP-14B and HP-32S were made with gold anniversary logos to celebrate HP's 50th anniversary. Some recent anniversary models are shown in the photo gallery. The power/patent labels on most Classic calculators are in mostly uppercase with the power consumption stated as 500mW (500 milliwatts). Some are completely uppercase with the power consumption stated as 500MW. Technically that's 500 megawatts but many power consumption labels are 100% caps so this is generally understood to still mean milliwatts. Early 9810s had a single LED for unit for each digit. Later models used the same five-digit LED elements found in the classic calculators. The HP-35 underwent many major physical revisions as shown in the HP-35 exhibit. Only the first version had a red dot that showed when the calculator was on. It also had a raised spot on the "5" key. The serial number was on the back between the rubber feet. The serial number on these starts with 1143A. The second version looked like the first but omitted the red dot. Early samples of this version still had a raised spot on the "5" key. The serial number was moved inside the battery compartment. Some of these also have serial numbers starting with 1143A. The first two versions were simply labeled "Hewlett Packard" without a model number while this and the next version was labeled "Hewlett Packard 35". In the last version, the upper rows of keys became black and rectangular rather than blue and square and the labels were molded into the keys rather than printed above them. This last version also had molded rather than painted "On" and "Off" legends and had just one silver trim bar below the display whereas versions 1-3 had 2. These bugs were quickly fixed and HP recalled early units for an upgrade. Like the HP-35, early HP-80s were labeled "Hewlett Packard" with no model number. "80" was added to later models. On early versions, the trim strip above the power switch was a piece of metal. Later versions went back to the vacuum-deposited trim used in other classic models. Like the HP-35 and HP-45, early versions had "On" and "Off" painted in white and later versions were molded. The HP-45 can be found with "On" and "Off" molded or painted on. Like the HP-80, early versions had a metal strip above the power switch to avoid wear on the silver trim. On later HP-45s the direction of STO - r and STO ÷ r was reversed. The manuals were also updated but some of the earliest model to be shipped with the later semantic came with a separate update page for the early manual. HP-9825As can be found with either low profile snap keys or more conventional taller keys. Some HP-25s have several bugs including polar/rectangular conversion errors for angles within +/- 0.000573° of 180° . Also when the last operation caused data in a certain range to be stored in a register and the calculator was at step 00, switching to Program mode would cause a blank display and switching back to Run would display Error. 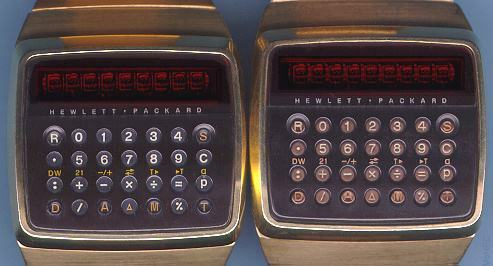 HP-01s in both gold and stainless steel can be found with bronze or black-colored buttons as shown in this comparison photo (27K) which shows a 1978 version on the left and a 1977 version on the right. See the HP-01 page for both versions in stainless steel. Earlier bracelets had links whose edges were polished to a mirror finish whereas later versions were brushed. Later versions added the legends "U.S. & Foreign Components" to the case back and "or plaque galvanique 10" to the bracelet clasp. Later gold versions omitted the gold plating from inside the clasp. These calculators can be found with or without a security cable attachment bracket. The bracket is metal and pivots out from the back right corner. On some versions, the keypad was metallic and had a smooth finish with metallic gold or silver trim. On other versions the keypad was plastic and the trim was light grey or light brown. The texture of the plastic keypads ranged from smooth to textured/matte. The 30 series also had two very different construction techniques. Early HP-41Cs used the same key shape used in the 20 and 30 series. Later HP-41Cs had lower keys with a gentler slope for the front (alpha) label. The exact colors, feel of the keyboard, and texture of the keypad vary somewhat over the calculator's long run. Later "Halfnut" versions had redesigned and simplified electronics. All HP-41s can be found in Halfnut versions although CVs and CXs are much more common than Cs. Early HP-41Cs had a number of bugs including not checking STO IND and RCL IND for proper range which allowed accessing system registers. The IND modifier also allowed out-of-range augments for flag operations. Early models also calculated SIN incorrectly for small angles and the CLP function would only clear up to 1089 lines. 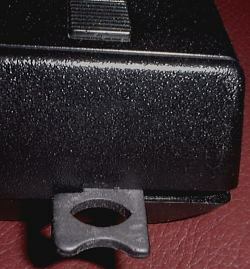 The HP-41C Option 001 ("Blanknut") can be found with or without a piece of plastic that covers the USER and PRGM keys. Most are HP-41CVs internally but some are HP-41CXs. Some, but not all, Option 001s have halfnut electronics. Some Option 001 Models don't have serial numbers. Versions can be found with the HP logo/model number in either highly reflective glossy silver or a matte-finished silver. Later models had painted rather than molded key legends. Late versions of the HP-11C, 15C and 16C were made with HP-12C keys that were either (re)painted or were made using worn molds for other keys. Some HP-16Cs had HP-12C keys that were first repainted to be HP-15C keys and then repainted to be HP-16C keys, or the final mold was used for three different keys. The picture below shows an HP-16C "F" key over an HP-12C "CHS" key. Some HP-12Cs also had keys that were repainted/reused. This appearance could be the result of repainting or of using the final mold for the CHS key for the final step in double-shot molding the F key. Reusing the mold would create the same appearance since the step of pressing the already-molded symbol into the final mold many times would create wear in the mold (even though it is much harder than plastic). (Re)painting seems to be the dominant theory among collectors (probably due to being first), but the curator believes that reuse of molds is more likely since these keys are clearly double-shot molded and repainting would have required an entirely different process to be applied to already double-shot molded keys. (Painting would also reduce their durability.) However, at this time, no one has been willing to cut one of these keys apart to see how they were created. On earlier versions the keyboard and keypad was somewhat glossy, but it was mat with somewhat different printing on the later versions. Also, there are several variations on the printing on the back and in the serial number placement. Early HP-11Cs had a bug in which if you entered a number in the form 0.0xxx, backspaced over all the digits and then pressed ENTER, 1.00 was entered rather than 0.00. HP allowed users of buggy calculators to swap for fixed units. Early 10C series units had flat metal springs and clear flexible plastic on both sides of the battery compartment. Later units had a much larger coiled spring with the plastic only on left side. The right side had a fixed gold-plated pin. The HP-12C has undergone numerous small modifications in its long run. Some versions have the display set deep and others are nearly flush with the top of the calculator. The right contact in the battery compartment may be relatively short and folded or longer and formed in a an arc. Singapore versions have a mat serial number area - USA versions are glossy. Get them while you can! Supplies are dwindling. If you must repair a pack, be careful. You can injure yourself or damage your calculator. There are several companies that can rebuild battery packs for you or you can make your own from scratch. Compatible cells can be found in both alkaline and silver-oxide. The silver-oxides tend to last much longer on the shelf and in the calculator. (For example: LR44, A76 , EPX76 are alkaline but SR44, 357 and G13 are silver-oxide. Check the package to be sure.) Any photo, electronics or jewelry shop should be able to help you. Is the number of years since 1960. Is the week (roughly) in which the unit was made. YYWW is not always exact and sometimes may have gone weeks or months without changing. Is the country code: A = America (USA), B = Brazil, G = Germany, J = Japan, S = Singapore, M = Malaysia or Indonesia. Example: The museum's HP-94F is serial number 2622J00025 indicating that it is the 25th unit made in Japan in the 22nd week of 1986. An HP employee wrote to say that date codes at HP were originally changed for engineering /design changes only. This system worked well for a test equipment company. However, calculators sold in higher volumes than previous HP products, which caused the serial numbers to run out. Because of this, HP started changing date codes more frequently. Exactly when this change occurred and whether all manufacturing lines used the same procedure is still unknown. Sometimes prototypes and test models fall into collectors hands with no serial numbers or serial numbers in another format. On HP 9825Bs, YY appears to be the number of years since 1970. Is the country code: US = USA, SG = Singapore, ID = Indonesia. Is the week (give or take) in which the unit was made. These are not always exact. These are the earliest date codes recorded so far for the various models. The date code is the first (left-most) four digits or first 5 characters for some post '96 models. Since this list was based on just a few hundred samples, you may have an earlier date code. If so, please send it to the museum for inclusion here. Please remember that it is the first (left-most) digits that are listed below, not the right-most. The right-most digits are simply a sequence number that is only guaranteed unique for a specific date code. Note that some models make it easy for serial numbers to be swapped so these numbers must be regarded with some suspicion. * See Variations and Special Models above or the HP-35 exhibit for HP-35 types. One Type 4 with a 1143 code exists but this was probably a serial number swap. Another Type 4 has been found with a date code of 1249 but its back has clearly been removed so it may be another swap. ** This serial number indicates a date more than 18 months before the official CV introduction so it may be a repaired calculator using a back from an HP-41C. ~2040 would be a more conservative estimate for an all-original CV. Earliest Halfnut version found: 2511. *** The earliest HP-94D recorded starts with 9990 but that's a prototype code. **** HP-9825B's used a different numbering system. *6 For many years, our lowest 48SX was 3001, but then one turned up with 2948. However it has some oddities: case has been opened (or maybe never even closed), and the ROM is in a DIP package with a hand-written label. This could be a development unit. Simply start from the beginning and work forward to the point of your choice. Many collectors find the earlier models more interesting because some later models are repackaging of earlier functionality. Some collectors avoid LCD models since they are newer and (in theory) have a more limited life. Some collect only the desktops because they're the "real machines"/"Big Iron"/etc., because so many features appeared there first or because it's a thrill to own a collection of machines that cost thousands of dollars each when they were new. On the other hand some collect only handhelds because they're more obtainable, take less room to store or were meant for individuals rather than organizations. There are some crossover products, so to be complete both handheld-only and desktop-only collections should include the HP-46, HP-81 and HP-97S. (The HP-94 is purely a handheld even though its software was developed on another computer.) Note too, that most collectors consider the 90 series to be handhelds even though they're rarely used that way. If you want to collect just the most "significant" models, here are some you should have: HP 9100A (first of all, first programmable, first card reader, first multi-line display, first expandable... etc. etc. ), HP 9810 (first chips, first option ROMs, first LEDs and more), HP 9820 (first algebraic - you can skip if you dread "the other system"), HP-35 (first handheld), HP-80 (first business, the beginning of solvers), HP-81 (first use of '.' to address beyond 10 registers), HP-65 (first programmable, first pocket calculator with mass storage, etc. ), HP-9825 (first "live keyboard", first true HPL), HP-25C (first continuous memory), HP-27 (business, stat, science in one small package) HP-10 (HP's only adding machine), HP-01 (not just HP's only watch - time and dates as data types), HP-34C (integration/solver), HP-41C (alphanumeric, expansion and I/O now in a handheld), HP-16C (the only one for computer scientists), HP-75C (first portable with BASIC), HP-94 (first backlit LCD, first built-in serial port, first x86 compatible), HP-28C/S (first RPL and first directories on the HP-28S), and HP-48SX expandable RPL, HP-32SII (fractions), HP-95LX (first pocket PC compatible). Try the 2nd hand stores, surplus electronics stores, flea markets in your area. Check the paper for government, university and business liquidation sales. An entire pallet or auction-lot may cost you less than a collector would pay for just one calculator. Some people have reported good luck and good prices at hamfests and even garage sales. Classified ads in newspapers serving areas where calculators were designed or produced have worked well for some. Scan non-HP groups - like every forsale group you have access to. HP's are advertised there by people who aren't aware of the HP and handhelds groups and prices tend to be more reasonable. (Dejanews makes this easy.) This is the source of many calculators sold on eBay. Some people post in every forsale group to which they have access. Readers in these non-HP, groups will often have an old calculator lying around which they consider old junk. Many of the calculators sold in the HP groups and in online auctions were purchased for peanuts in this way. There is a risk: after posting several hundred messages, one ebay HP dealer was admonished by his ISP. Access off-internet forums on services like AOL and Compuserve. (Put those free-trial disks to good use.) Many of the readers there don't venture out onto the net and haven't seen eBay prices. Ask your friends. Try to find friends of friends who used to work for HP. One ex-HP employee threw an HP-95C anyway in 1996 because he didn't realize that someone might want it. Many old calculators are free for the asking! As of 1997, cheap calculators are still readily available. Advertise in the Museum Classified Ads. Scan the newsgroups comp.sys.handhelds, comp.sys.hp48, and comp.sys.palmtops frequently or post a wanted ad. Be cautious with auctions especially on the net. Sometimes prices stay reasonable but other times items have sold for many times what they could be purchased for elsewhere. Don't assume that your competition knows the "true value" of the item! They're probably assuming the same of you! Often, two collectors have both decided that they will have the item regardless of price and sometimes a collector is bidding against a shill. Also, if the reserve seems unattainable, the seller may be trolling for a fool. Prices can vary by factors of more than 100 from the cheap to ultra expensive end of the scales. One dealer claims to make nearly $30,000 per month reselling items on eBay. In 1997, the museum picked up extra copies of the relatively rare HP-10C, 31E, 65, 70 and 94D (and several common models) all in excellent or better condition and all for $20 or less. A recent local sale had over a hundred HP-41C modules and options priced at "4 for a dollar". The recently added Friden 132 was picked up for free two weeks after one like it sold for several hundred dollars on eBay. Calculator collecting can still be a low-budget hobby. The trick is to find dealers who haven't seen eBay yet. They're still plentiful but the word is spreading fast so hurry! In 1999, one collector reported buying (over a 6 month period) several HP 41's, an HP-38C, 37E, 35, 45, a complete boxed HP-97 and, most recently, an HP-91 with manual. All were purchased at thrift stores for under $10. In 1998, he purchased an HP-70 with manual and multiple accessory books for $2.99. Legwork can still pay off. In 1999 EduCalc's HP-41, HP-71, and HP-75 stock was being cleared out by Interfab. The items were so reasonably priced that many of them were immediately resold on eBay for 5-20 times as much. In 2001 a collector in Switzerland picked up an HP 9100B from a Swiss military institute. The institute had advertised the machine since 1999 and received many emails expressing interest but no one was willing to arrange the transportation. The collector picked it up. The price: Free. This is a technique that the curator has used frequently. Many government agencies and businesses simply won't deal with shipping and there are more within driving range than many people realize. Many of them don't advertise in obvious places. Sometimes the best way to find them is to call the numbers in the phone book and ask. During the same week of 2002 an offline sale of an HP-16C was reported at $25, and an Ebay auction finished at $842. (The latter included the box.) Another collector found an HP-67 and an HP-97 for one dollar at a local surplus store. Both had gummy card reader wheels, but were in great shape otherwise. Another collector reported: "2nd hand/thrift stores work much better than eBay ... I picked up a 11C (in crumbling case, with only a few scratches) for $1.50 about a month ago, and yesterday, I snagged a 16C (mint in case) for $3." In 2003 a European collector reported off-line purchases of a near perfect and nearly complete HP-67 for $65 and a similar condition HP-25 for $50. In 2004 a European collector reported off-line purchase of a perfect HP-42S with all accessories for $50. In 2005 a collector in Idaho found a working HP-35 (with early bugs) in excellent condition at a local thrift store. It had no scratches or engraving and was priced at $1.50. In 2006 a user in Florida found a working HP-11C at a relative's garage sale for 5 cents. In 2007 a collector in North Carolina found a working HP-41CX, with box, manuals, and a Stock Forecasting module at a Habitat for Humanity junk store for $1. It's easiest to buy a calculator locally where you can check it over first. If you are buying at a distance, here are some guidelines. Has it been fully tested? Do all keys work properly with no bounce? Does it run on both AC and battery? (Inability to work off the battery doesn't always indicate a battery problem.) On HP-41Cs, you want to make sure that the case halves are still tightly held together or the calculator may be unreliable. Is there any sign of a battery leak such as metal corrosion or discoloring of the labels inside battery doors? Have there been any repairs and, if so, are the repairs obvious? Does the calculator look "new"? A statement like: "It's in good condition" may mean remarkably different things to you and the seller. Does it have any scratches? Is there any missing or repaired silver trim? Is there any shining of the plastic around switches? Are there signs of frequent cleaning such as a crosshatch pattern worn into the keypad due to cleaning between the keys? Is someone's name engraved on it? Does it have any residue from spilled liquids or removed property tags? Does the calculator smell? If you have a sensitive nose, it may be offended by calculators owned by smokers. More complete samples, with case, manual, box, and inserts are always worth more than a calculator alone. Make sure you have more than an email address for the seller in case something goes wrong. Yes, that's a lot of questions but in any collectibles field, its the more advanced collectors who ask the most questions and end up with the best samples. Of course, you'll rarely get positive answers to all the questions above. For older manuals or copies, try the above or try HP on the web or at: (800) 227-8164. Rechargeable battery packs are becoming difficult to find. There are several companies that can rebuild battery packs for you or you can make your own from scratch. For thermal paper, try the PM Company. On their website, enter a calculator like HP-97 and Search by Machine. For other items, please read or post a message in the Museum Classified Ads or in comp.sys.handhelds.